Illustrated by Wilson Williams, Jr. This a a preview of the kindle version of Julia Dweck’s newest book to be officially released on September 5, which can be preordered at a discount on Amazon. I was really surprised to learn that a girl named Mary Sawyer did have a little lamb that she brought with her to school in Sterling, Massachusetts around 1830. A statue of the lamb remains in the town today. Ms. Dweck dedicated this book to her husband Sheppard and named her sheep character after him. 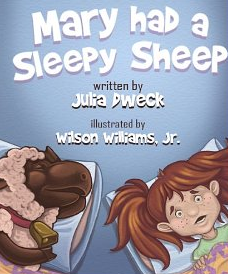 In this new retelling of the classic nursery rhyme, Mary has a pet sheep with a problem; it never seems to be able to stay awake. When Sheppard shows up in Mary’s bed, her mother yells, screams, and kicks the animal out of the house. Mary is desperate to teach her pet to sleep. She tries reading it books, dancing lessons, spraying it with garden hoses, and tickling it with feathers. Mary feeds her sheep spicy food, snacks and drinks. She sprays her sheep with shaving cream, turns the heat off and blasts her music on the French horn. Finally, Mary decides to try a technique that humans use when they can’t get to sleep. To her surprise, it works! Now she has the opposite problem; Sheppard can’t seem to stay awake! As is the case in most of Ms. Dweck’s other books, the rhymes are cleverly written in four line verse. My only concern in this kindle version is that the text is written in white letters that get washed out in the color on some pages making it a little difficult to read. Some parents may take issue with the fact that Mary’s mother literally kicks Sheppard out of bed while yelling and screaming at the sheep. Very young children may misunderstand the illustrator’s attempt at humor. There are lots of bonus features included with this book. Four website links will allow the reader to explore his skills in being a cartoonist, actor, designer or author. Readers are asked to search for the picture of a hidden mouse on each of the pages. There is a separate “find what is wrong on this page” activity as well. Children are encouraged to continue learning and having fun after they finish reading the book making this purchase a good investment. If you enjoyed reading this post, please click the word Follow or subscribe by hitting the orange RSS feed button in the upper right hand corner.